Become a Chabad Partner today or renew your partnership / membership for the 5778 new year! 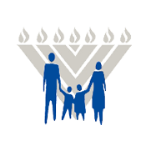 Partner with us in building a vibrant and proud Jewish community! Help Chabad bring more light to the community with your generous contribution. Seat Suggested donation is $100 each, not required. Please submit your billing information below. No one will be turned away for inability to pay. Your confidentiality is crucial to us.